Creamy smooth DQ soft serve blended with your favorite candy, cookies, or fruit add up to one irresistible taste sensation. Fan Club sign-up gets you a BOGO Blizzard Treat coupon just for signing up, monthly emails announcing the Blizzard of the month and an extra-special coupon on your birthday and surprise on your anniversary! Blizzard Fan Club sign-up required to get coupon via email. I have always really enjoy the food at Dairy Queen. Food is always made fresh when you order. 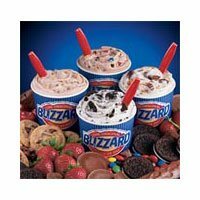 But we sure can't leave out their Blizzard's my favorite is Banana Spilt, all great flavors. I give 5 stars!! The Blizzard treats are wonderful, they are so creamy and sweet. They taste just like they are supposed to and they are simply wonderful. DQ has the best Blizzards anywhere. I visit often. Love the moolattes. I love Dairy Queen Blizzards! They are so creamy and delicious.